This week I managed to get my Modern Metallic mini quilt finished, just in time to get it entered in PNW Metallic Challenge competition. This quilt is made up of 3 inch log cabin blocks, you can find the paper piecing pattern I used in my original post. 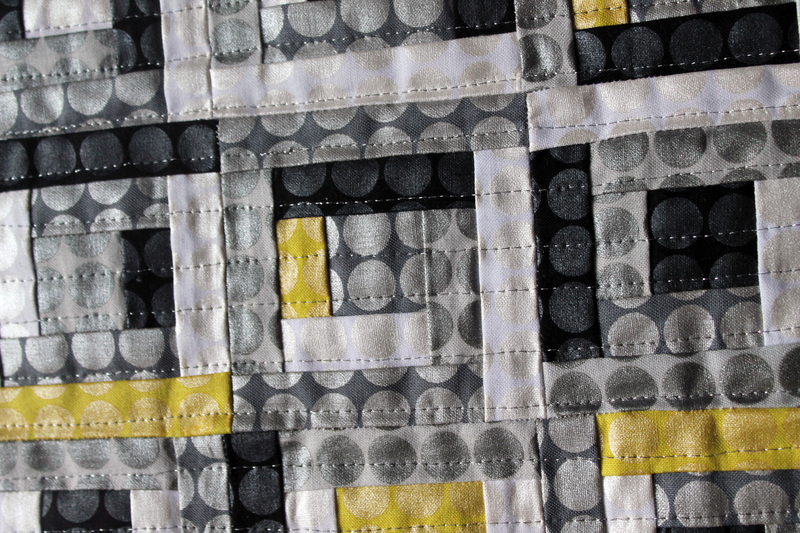 As it was a metallic challenge I choose my most favorite metallic fabric, Michael Miller’s Mirror Ball Dot in Rice, Silver, Platinum, Onyx and a splash of Citron. I knew I really wanted to quilt with metallic thread though I had never done it before. First up I tried hand quilting but that was an unmitigated disaster. Metallic thread is so fine that I was just making a hash of everything. 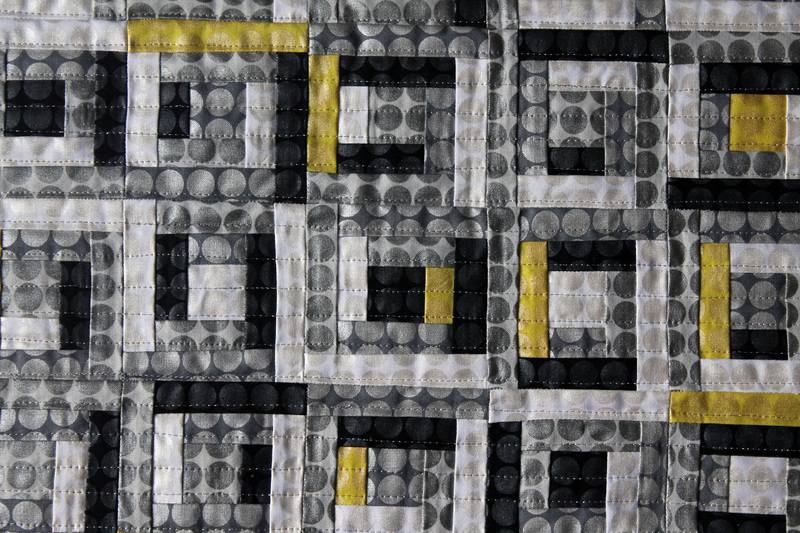 After several attempts to get hand quilting to work, I finally resorted to machine quilting, which has its own issues. 1. Use a new, sharp needle. 3. Loosen the upper tension on your machine and make sure the metallic thread is not catching on any particular point. 4. Stitch really really slowly to avoid breakage. 5. Try not to get too upset when the thread breaks. I can not imagine trying to quilt a normal size quilt with metallic thread. I do not have the patience to even attempt such a feat but I will be forever in awe of anyone who is crazy enough to do it! As for the last step, binding, I was ridiculously indecisive and actually bound this quilt twice! My first biding was a citron solid – which I was not thrilled with and so unpicked. I finally settled on a solid black binding, something neutral and not too fussy. I have never unpicked a binding before but when you are dealing with something so small you can make these rash decisions and change your mind without too much hassle. Too funny. I must admit I think this quilt is darling but it really feels like cheating because it is so small. Another winner! I love this – it is great in all its details. I agree – metallic thread is a real challenge. I handquilted a wall-hanging and did a fair amount of cursing throughout the process due to the metallic coating separating from the substrate and making a big booger, thread breaking, etc…..but – it sure is pretty when the light catches it! So glad to hear you’re feeling better and lovely to see your posts again. Hope you continue to get lots of R & R.
Thanks Liz. It is nice to be getting back into the swing of things. How on earth did you hand quilt with metallic thread? Did you use embroidery thread? WIth curses and carefulness, I’m telling you! I realized I had to use short pieces of thread – no more than about 10″ – and even then it’d separate, break, etc sometimes. No, I used metallic machine thread – I couldn’t see how it could possibly feed through a sewing machine – I’d be bald if I’d tried! I still have nightmares from using metallic thread. This is gorgeous though. I love the pop of color! Love your quilt! Yes, metallic thread isn’t fun in the least! Thanks for all your work at last night’s meeting! It was a great meeting last night. I loved Bills 1970’s quilts. It made me want to pull out every piece of loud bright fabric in my stash. That is extremely cool, and I’d be quite happy hanging it on the wall as a piece of art! The splashes of acid yellow are absolutely spot on. Good work! i love this! I’m having such a hard time finding fabric to go with the ones I have. I can’t find that mirror dot ball around here. I ordered it in blue, but guess what… It’s not going to get here in time. I’m so sad!! I have a bit in my stash and I am happy to share with a fellow local quilter. Let me know if you want to raid my Mirror Ball stash. 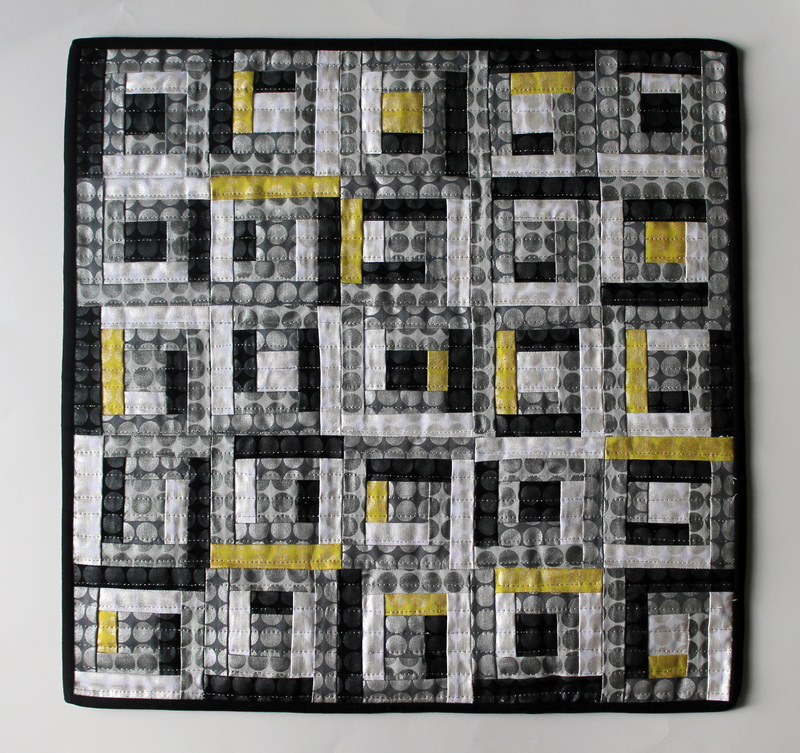 I think you are awesome for successfully quilting a mini quilt with metallic thread! And the splash of citron? Heavenly! I once had the idea to use metallic thread and my class instructor said, “don’t do it.” I didn’t so I’m so envious that you tried and succeeded. I have some metallic thread in my drawer and I cant get it through the eye of either a hand sewing needle or a machine one. I just have to look at it and it starts unravelling. I’m planning to find it anothet home but hate to admit defeat. Well done on your success. This is my favorite fabric & this quilt is stunning!! I think the binding you ended up with is best because it doesn’t take away from the design. 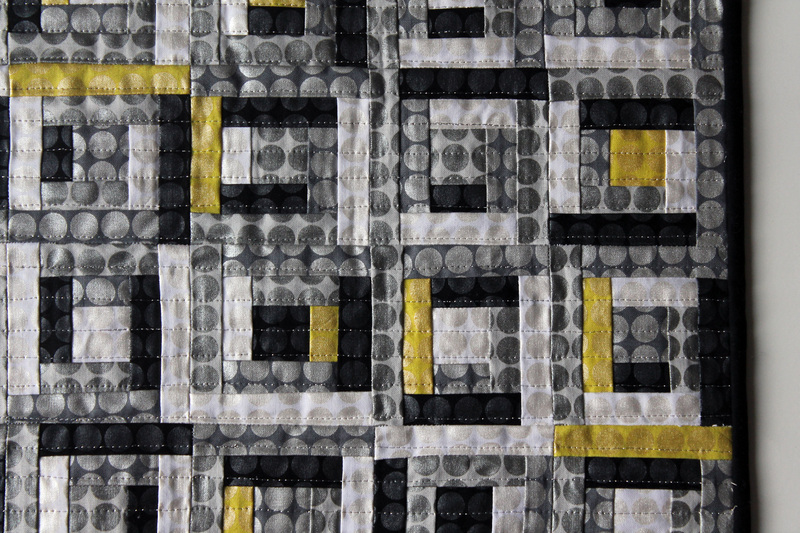 Love the colors in this quilt, with the pop of yellow. Can quilts with metallic thread be washed? My metallic thread sits in my thread box, looking pretty. That’s all. I am feeling braver with tricky and bulky decorative threads now I know that sometimes it is a case of shoving them in the bobbin, adjusting the tension and turning your project upside-down.